John Muir was a Scottish- American naturalist and member of the Sierra Club, a conservation organisation which founded the U.S. National Parks – in particular Yosemite and Sequoia National Park both of which he spent many years exploring. Last year, when Maj Les Webb suggested an expedition to trek across The High Sierra Nevada, California and summit Mount Whitney, most of us covertly looked at the map to see exactly where this mountain range is located. This all sounded very exciting but many of us still had stereotypical images of California floating around our heads – beaches, barbeques and long, hot days. Just how wrong could we be! Training began in Capel Curig in late November 2015 with a week qualifying as Summer Mountain Foundation leaders. Wales was pretty much under water that month and with rain still falling our hopes of an easy time were washed away. Further training in late January 2016 continued the aquatic theme with a swimming test in Charlton Outdoor Pool and then instruction in map reading, first aid and camp craft. Lengthy kit lists and work up training sheets were distributed and jobs delegated. Discussions on how to deal with bears, rattlesnakes and scorpions left some of us wide eyed and slightly apprehensive but the expedition was shaping up to be all it should be: an amazing adventure in remote, unknown territory. The Advance Party left Woolwich on 14 June and had a busy few days preparing for the Main Body’s arrival on 18 June into Los Angeles. Five soldiers from the King’s Troop Royal Horse Artillery joined twenty-seven members of NRHQ RA for EX CDS. WO2 Morris, the Master Saddler brought the Farrier and three others to act as our Support Party. These soldiers left behind their hugely high profile day jobs (The Queen’s Birthday Parade had taken up much of their time the previous month) to support the expedition by carrying out a mounted resupply on horseback with packed mules during Phase 1. Maj Antonia Hazelrigg joined us from HQ AMD as the Expedition Medical Officer along with Capt Rachel Gillies, a Nursing Officer from 204 (North Irish) Field Hospital to act as OC Support Team. Both officers have previous experience in the deserts of South Western USA. After a long flight and a surprisingly quick transit through US customs and immigration, we had our first night at a motel close by. The road trip North up to the mountains began early the next day, interspersed with coffee/ice cream stops and a trip to Walmart to buy essentials for the trek. Maj Catherine Eve was very proud of her $4.60 fish filleting knife and optimistically hoped would be for all the fish we would catch whilst on the trail. 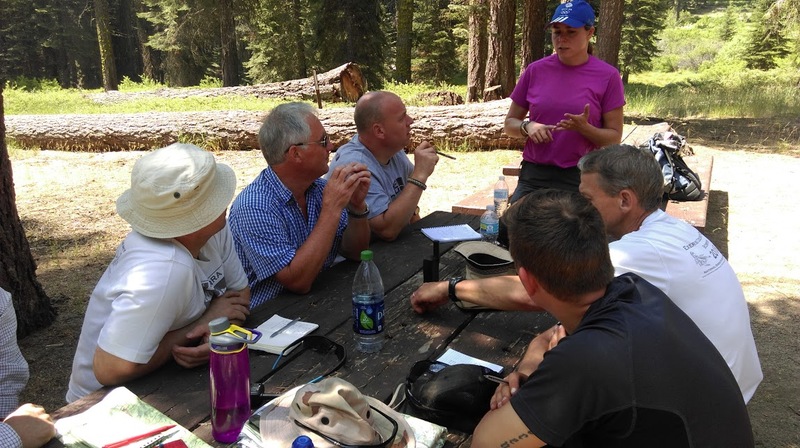 After a night in Visalia, in the foothills of the High Sierra Nevada, we set up camp in the Kings Canyon & Sequoia National Park and so began our Mission Specific Training (MST) and ground orientation that is so vital for such an expedition. Bear boxes are obligatory for anyone camping in the backcountry and all food, waste and toiletries must be stored properly so that bears are unable to access human food and thereby associate humans with food. By all accounts this is effective as one Park Ranger explained that incidents involving people and bears have lessened over the last few years as bears stay more ‘wild’. Along with group permits for the trail, bear boxes were rented from the Wilderness Office at Lone Pine and Meals Ready to Eat (MREs which are similar to UK ORP ‘boil in the bag’) were distributed. With nearly a year of planning and months of anticipation, we were all eager to begin. On 22 June, two teams of nine and one of six left Crescent Meadow (elevation 7, 200ft) at hourly intervals. The National Park is the size of Wales and only 500 people have permits at any one time. Rangers are strict about groups bunching up and therefore each team maintained separation on the trail. The first few days on the trail were tough for us all. Carrying approx. 23kgs of weight over steep terrain in temperatures around 90F was physically exhausting. The most flattering way to describe the majority of officers and soldiers in NRHQ RA is ‘mature’ and the average age of the trekker on the trail was 52! Sore knees, achy backs and shoulders became familiar complaints yet we continued onwards, ever stoic and positive. If bodily ailments were causing discomfort, we took delight in the most amazing scenery. Climbing up steep sided mountains with spectacular views, dropping into lush restful valleys with bubbling streams; passing close by raging waterfalls and weaving through tall trees that seemed other worldly – each day held new and wondrous sights. By night, we wild camped in our teams by lakes or rivers, quickly setting up tents and making a hot meal – each person taking on a task for the good of the group. As the sun dropped and darkness descended, we listened to the night noises before sleep overcame us – often by 8.30pm. It wasn’t long before our bodies were in tune with dawn and dusk and we relished the simplicity of backcountry trekking. We saw very few people on the trail until we came close to Mt Whitney several days later. 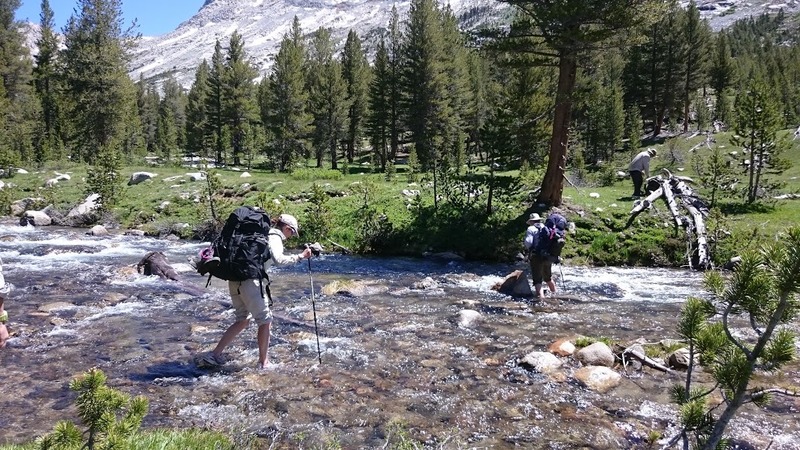 The John Muir Trail and the Pacific Coast Trail both join the High Sierra Trail at Wallace Creek which was the RV point for the resupply. We arrived early on 27 June and sat with the other two teams in the shade awaiting a welcome glimpse of horses and mules. Sure enough, they arrived on time, each mule carrying 150lbs of provisions. Gunners Courtney Evans and Vicky Redfern were following LCpl Dan Martin from King’s Troop, each riding a horse and leading a packed mule. Their hands were black with dirt and they looked exhausted. ‘This is really hard work’ said Vicky, ‘much harder than anything we do in London’. It was fantastic to see these soldiers out of their ceremonial uniforms and in the middle of the Wild West using their equine expertise in order to support our expedition. 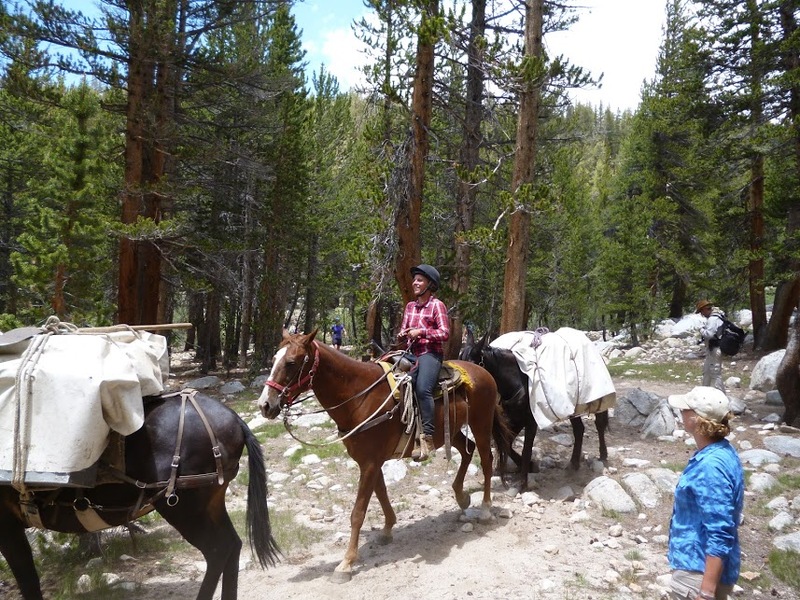 Horse riding and mule packing in the High Mountains is fiercely hard work and just as much a challenge pursuit as trekking. All teams swiftly gathered more food, clothing and dropped off garbage for the mules to carry back out. Time was of the essence in order to make the next camp before dark and then summit Mt Whitney the following day. A storm was forecast for late afternoon and everyone was aware of the importance to summit before the storm came as lightning strikes on the mountain are dangerous. 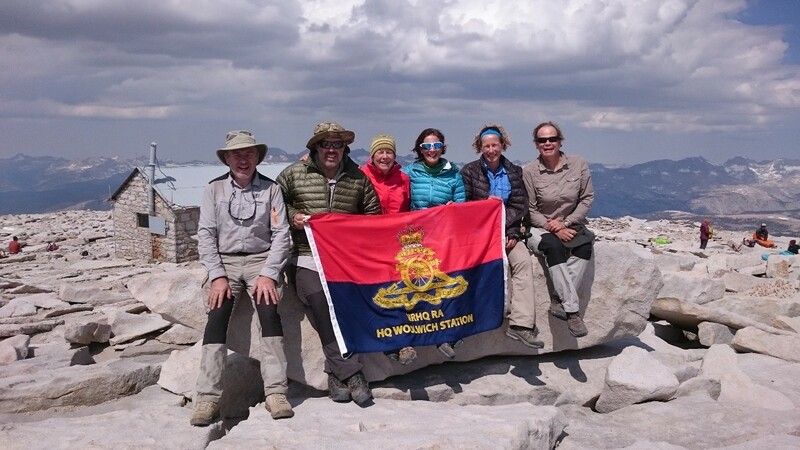 We were lucky – the next day was calm and afforded good weather for us all to stand on top of the highest mountain in continental USA. Feeling on top of the world at 14,508ft, only the thought of descending 99 switchbacks to get off the mountain could alter that fantastic feeling of achievement. We’d made it! After another night under canvas and then some much needed rebalancing in a city close by, we welcomed the CO, Lt Col Bill Bolam and 2IC Maj John Eldridge and waved farewell to 5 ‘early leavers’ (as Reservists, some of the unit were unable to secure more than two weeks leave from their civilian work). Decisive Phase 2 was under way and we road moved out to the Southern Rim of the Grand Canyon. After some MST, ground orientation and a set of orders, two teams drove to the Northern rim and the rest remained on the South side. All teams began the descent around 9 am on American Independence Day, 4th July. 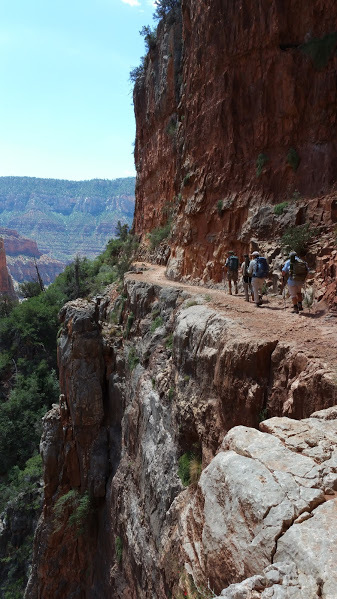 Traversing the Grand Canyon on the Bright Angel Trail is 23 miles from rim to rim and the descent/ ascent profile is 5,700 – 6,700ft depending which way you go. Summertime temperatures regularly reach over 110F and there is very little shade. All teams made good progress down to Phantom Ranch at the bottom of the Grand Canyon and rested up for a couple of hours. Some cooled off in Bright Angel Creek, others were lucky enough to buy a cold lemonade at the café during the short opening hours. 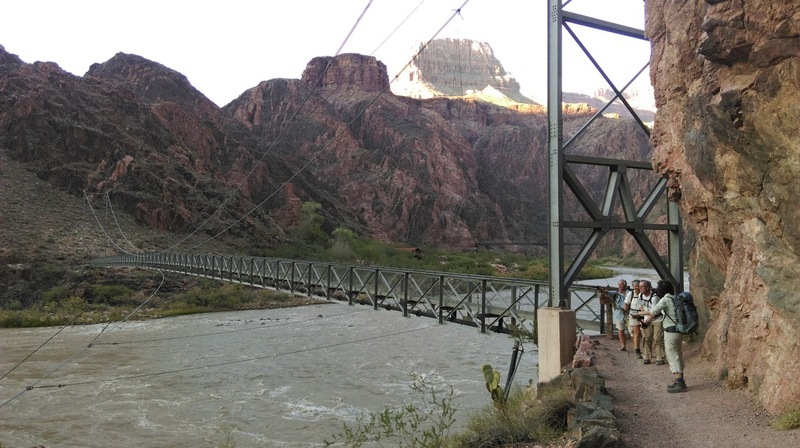 By 6.30pm, all teams were on their way – 13 miles left for those going to the North Rim and 9 for those heading up to the South Rim. Crossing and then passing alongside the Colorado River, the evening light played tantalisingly on the tips of the rock formations above us. This is a magical place. We soon began to climb upwards, forever turning and climbing, climbing and turning until the dusk became night and we fumbled for our head torches. The night sky was bursting with stars and the rocks formed majestic silhouettes as we weaved up the Canyon. And yet it was a very long night. We finally arrived at the Visitor’s Centre at 3.30am, completely exhausted. Phase 2 complete. The night flight from Las Vegas back to Gatwick was blissfully uneventful. We headed back to Woolwich to sort out group kit and then dispersed. Now back at home, I’m finding it hard to believe that I’ve just had one of the best experiences of my life. 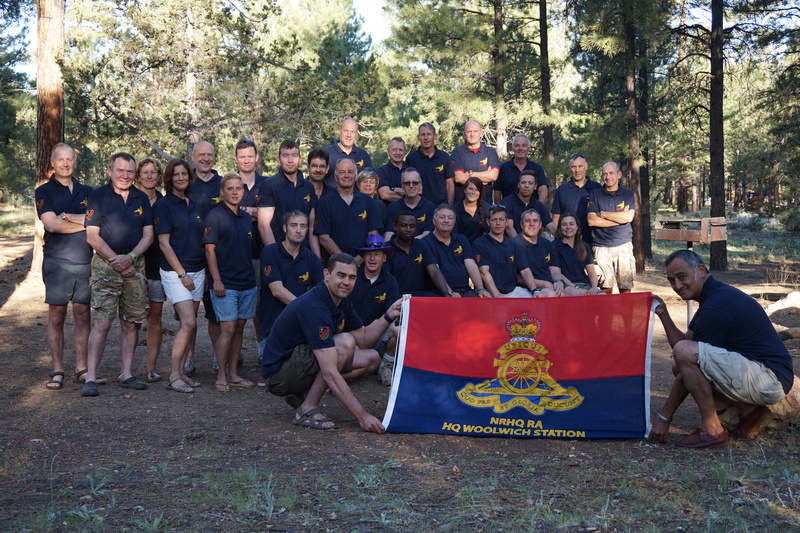 NRHQ RA Officers and soldiers would like to take this opportunity to thank The Ulysses Trust for their very generous support to EXERCISE COCKNEY DESERT SCORPION by way of good advice and financial assistance. Without this support the Exercise would not have been financially viable. It has been many years since the unit has planned and executed such an ambitious adventure training expedition. EX CDS provided the opportunity for Reservists and Regulars to form a number of diverse units and work together in a high risk and remote, hostile mountain environment, improving field skills, team cohesion, self-reliance, navigation and physical endurance. Thanks must also go to our Expedition Leader, Maj Les Webb for all his hard work over the last year. We are all immensely proud of our achievement and fully appreciate that this would not be possible without funding. Capt Louise Bartlett, RSIGNALS, delivers training in use of satcom phones and radios.